Real Madrid manager Rafael Benitez has reiterated that Manchester United target Sergio Ramos is "100%" staying at the Spanish club. Last month, United had a £28.6m bid for the 29-year-old Spain international defender rejected by Real, who want Red Devils goalkeeper David De Gea. Ramos is reportedly unhappy with the salary he has been offered as part of a new contract at the Bernabeu. "Sergio will be staying with us," said Benitez, who became Real boss in May. The former Liverpool manager said football was a "curious world" and he had "a lot of respect" for United counterpart Louis van Gaal. 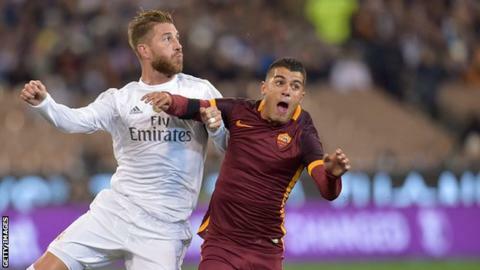 But asked if he was sure Ramos would stay, the Spaniard said: "For me, 100%. "I insist that it is clear for me and the club, Sergio will be here. He's a key player for us." Ramos, capped 128 times, has made 445 appearances for Real since joining from Sevilla in 2005. He is part of the Real squad preparing to face Manchester City in a friendly in Australia on Saturday.